I'm not sure why I even said yes. 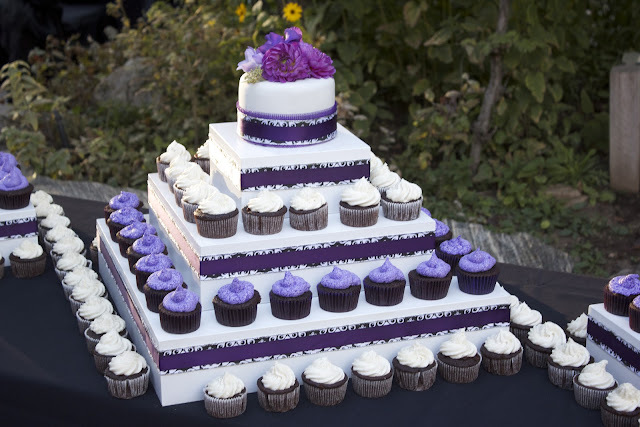 I'm not a professional by any means and I've never done anything near a wedding cake before. It was soon after my cake won a ribbon at the state fair though so I must have been at a weak moment when my brother asked if I'd make their wedding cake and I actually said yes. The only reason I even considered it though is because they said they wanted something less traditional and were thinking more of a cupcake tower. So I was stuck when I came around to my senses and had to figure out what I wanted to do for them. They said they were open to ideas so we started a little Pinterest board and started collecting ideas. I knew they wanted simple but elegant but I have a tendency to go overboard so we had to restrain ourselves. Since of course I care more about what it tasted like than what it looked like, I started first though with creating the best cupcake recipe I could. I knew she wanted something chocolate and on the rich, fudgy side of chocolate. So of course, we had a tasting party. For this party I created five variations of recipes that I had scoured and combined, imagining what I thought would be the best flavor. Secret ingredients included Dr. Pepper, sour cream, nutella, coconut oil and even red beets. A clear winner was identified and I knew that no matter what the cake looked like, at least it would taste good. 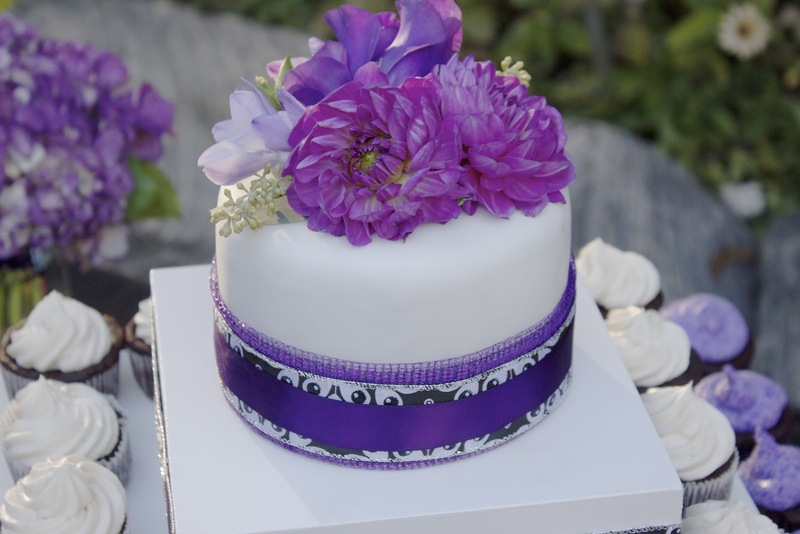 As for the decorations, I had high intentions of glazing it similarly to my ribbon cake and then using the same chocolate I use to make the ribbons on that cake to do some lace decorations. I just couldn't get it to work right and the night before the wedding I scrapped that idea and went simple. White fondant with some ribbon and topped with a beautiful flower arrangement. 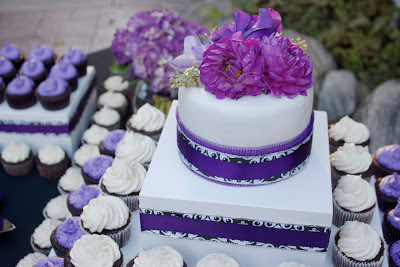 Again, my focus was more on the cupcakes but the cake still had to look good. We made the towers for the cupcakes earlier in the week and wrapped them with coordinating ribbon. 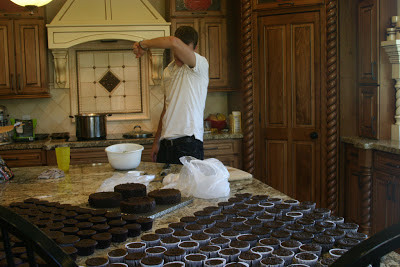 Two days before the wedding I made 215 cupcakes. 10 original batches. A huge mess. 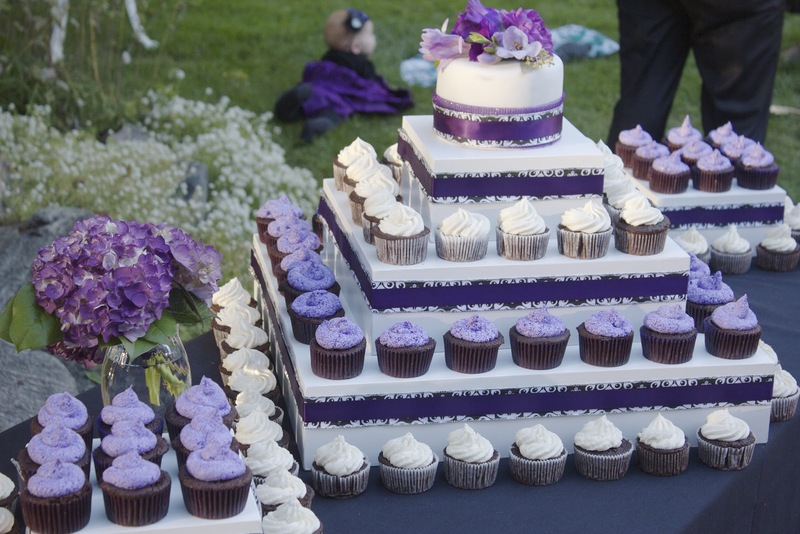 The morning of the wedding, I whipped up 10 batches of my roux frosting, half purple and half white. Packed it all up and was ready to go. We frosted all the cupcakes on site just to eliminate any chance of ruining them on the way. And we were done. Whew. I have to admit, I thought it looked pretty good. I had tons of help from everyone there and was so thankful for my sister in laws family for letting me take over their kitchen! 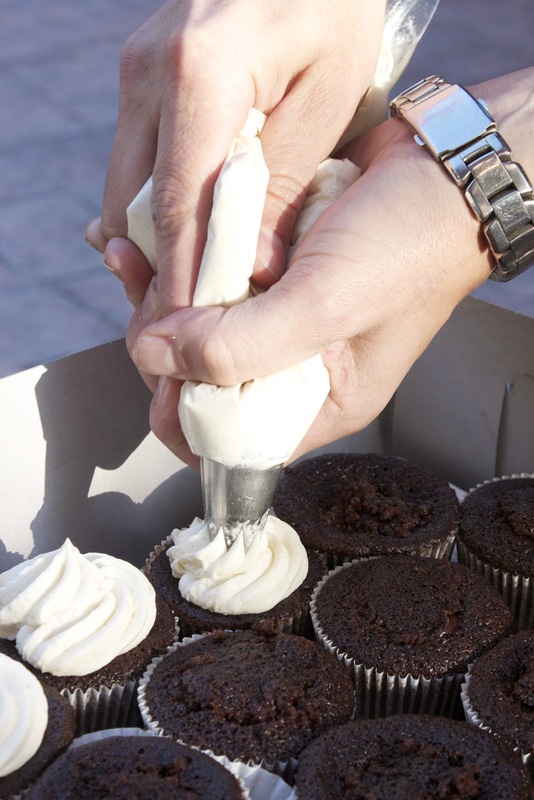 And now you get my cupcake recipe. I haven't shared it with anyone yet but if you like rich, fudgy chocolate cake, I think you'll like this. It has nutella in the batter and then I also core out the center after cooking it and fill it with more nutella. Don't worry when you see how runny the batter is either. Trust me, it cooks perfectly and is so moist throughout. Line cupcake pans with liners and set aside. Sift together the cocoa, sugar, flour, baking soda and salt in large bowl. In a stand mixer, mix the melted butter, buttermilk, eggs, egg yolks, vanilla, nutella, sour cream and hot water until well combined. Add dry mixture to wet, and mix until just combined--careful not to over mix. Sounds absolutely amazing! Your family is so lucky to have such a great chef to depend on. Seriously stunning, you did an amazing job! The cupcakes sound like heaven, I love chocolate and Nutella! AHh They are SO DANG GOOD. We wiped all the extras clean days ago!! What a beautiful job you did. I'm sure your brother and his wife were so thrilled. Looks beautiful! What kind of frosting is on top - a buttercream or meringue? Beautifully done, Matt. It all looks amazing. I was so excited when you said yes to making it! We can't thank you enough for all the work you guys put into this!! They were AMAZING! 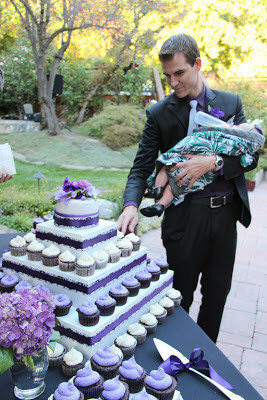 I am so excited you put the recipe up because I have been craving them ever since the wedding!! I snagged a couple for breakfast the next morning and was so made I left them in the mini fridge at the hotel! Thank you Matt! Oh! That’s so sweet! 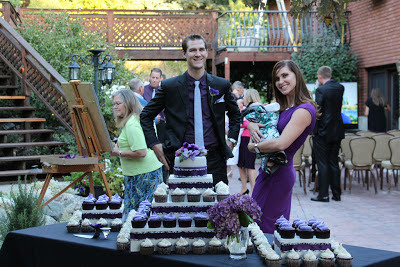 The cupcakes were amazing! 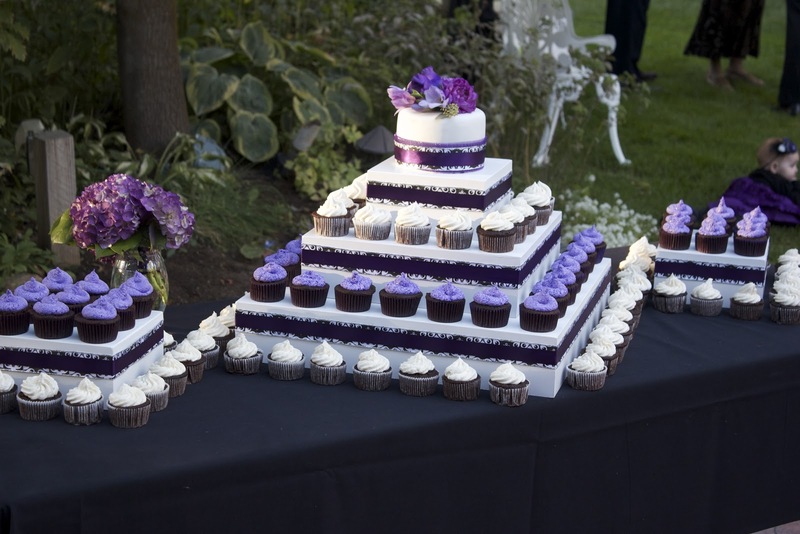 I will have to suggest this to the long island catering halls to include Chocolate Hazelnut Cupcakes in our menu for our wedding! It took, probably, lots of time! I think, I have not enough patience for that. I think, I can try to make something like that in my rice cooker. And you, maybe, too. Just watch zojirushi rice cooker reviews - top picks 2016 and get new experience.